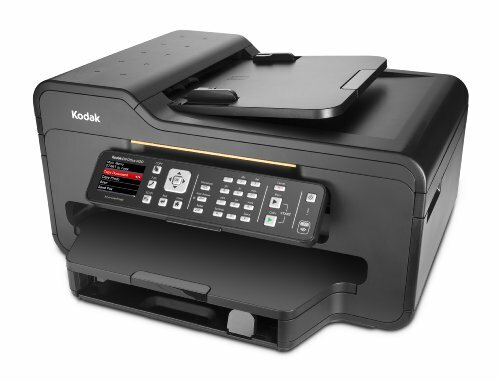 The Kodak ESP Office 6150 is an all-in-one printer designed, as its name would indicate, for home office use, offering print, scan, copy and fax functionality. 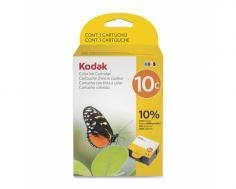 It offers a number of larger capacities and improvements upon Kodak's home high-resolution photo printers, making it significantly more viable as a single device to handle home paper use. The printer measures 17.5" by 9.5" by 16.8" and weighs 18.7 lbs, making it fairly portable and easy to place alongside most consumer-grade computer equipment. If necessary it can be placed on its own desk or table. The printer has a maximum print resolution of 4800 dpi for color printing and 1200 by 1200 dpi for monochrome text, consistent with other models like this one. It produces prints at speeds of up to 32 pages per minute in black and up to 30 pages per minute in color, and can produce a 4" by 6" photo print in 29 seconds or less. 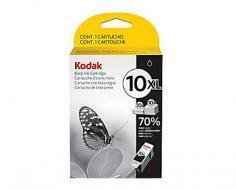 The printer supports printing to standard-size borderless documents up to 8.5" by 11", 216 by 279 mm, and 8.5" by 14". Larger, wider printers can print to wider documents, as well as longer ones, but this is consistent for other lower-end graphics printers with relatively small footprints. The printer also includes a 200-page high-capacity paper tray and a 30-page automatic document feeder, both of which will help to fulfill the printing needs of small office and home office users who would otherwise require another printer to process large documents. The built-in copier has a document copy speed of 27 copies per minute in black and 26 copies per minute in color. It supports processing documents up to 8.5" by 14" in size when run through the ADF, and can produce up to 99 copies at a time. The copier goes beyond many other consumer copiers, and many industrial ones, by offering scaling on a range between 10% and 500%, significantly wider than the 25% to 400% offered standard. The built-in scanner has a resolution of 1200 dpi for optical scanning and can perform 24-bit, 9600 dpi optimized scans of documents sized up to 8.5" by 14" (again using the built-in ADF). Optical character recognition is integrated into Kodak's software suite for Windows users. The unit includes a built-in automatic duplexer and automatic document feeder, making it considerably closer to more industrial, heavier-duty multifunction units in terms of capabilities. The built-in fax system transmits documents at a maximum speed of 33.6 Kbps and has a memory of up to 100 pages, as well as support for up to 60 speed dials. The printer connects to systems via USB 2.0 or via 10/100 Ethernet. However, it also includes support for 802.11b/g/n-based wireless networking and includes support for remote printing from Apple's iPad, iPhone, and iPod touch wireless devices, as well as some Blackberry systems. Like many printers, the ESP Office 6150 does not include a USB cable, requiring that you purchase one or allocate one previously owned to the printer in order to connect it. This is more of an inconvenience than a con, but it is worth noting. Many users report that the printer's speeds are well below those advertised. Review it: "Kodak ESP 6150 "
The printer requires a dedicated black and a dedicated color ink cartridge in order to ensure printing. Cartridges are included with the printer, and can be replaced with Kodak 10-series cartridges (10B or 10XL for black, depending on if you need a standard or high-capacity cartridge, and 10C for color).